Michael returned to F1 to race for the Mercedes GP Petronas team over 2010-12, having signed a three year contract with them. Nico Rosberg was his team mate. The move saw Michael reunited with Ross Brawn, who he worked with to win all of his world titles. It marked the first time recent champions Hamilton and Vettel raced against the legend. 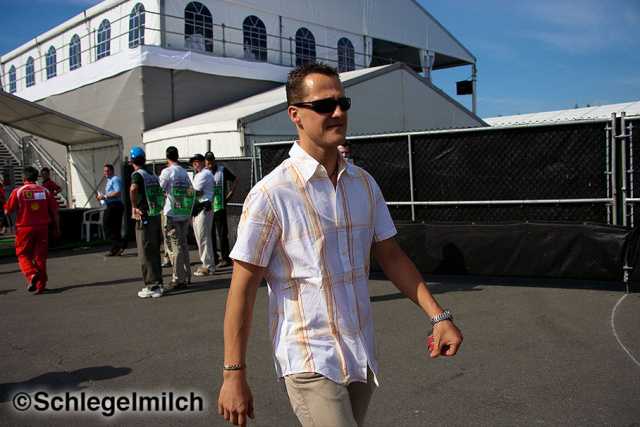 When announcing his return at the end of 2009 Schuey made the following comment, “I have decided to return to Formula One. Mercedes GP and I agreed on teaming up for the coming 3 seasons. And to be honest, I’m already super excited by the prospect to be back in a F1 cockpit. I don’t want to deny at all that the idea of a German F1 team extremely tempts me. I guess every German driver would feel this way. And of course it plays a major role that I again can work together with Ross at Mercedes GP. Above all, however, my old hunger for racing is back. In Abu Dhabi, when Ross asked me if I could imagine returning to F1, I felt that I wasn’t ready for it. But only two weeks later, when he called me once again, I realized that my old passion was returning. Suddenly I was on fire again. For me, the imagination to be back in a F1 car and to compete for the world championships is exciting and extremely inspiring.